James Loney is on the verge of becoming an extremely good hitter. He already walks more than he strikes out. He hits for a solid batting average and because he hits in the solid Dodgers lineup he collects a solid number of Runs and RBI. However, he has no real power especially for a first baseman. Loney will be 25-years old when the 2010 season begins. He is still young enough to be developing the power that fantasy owners want to see from their corner infielders. The vast majority of his scouting reports (remember he was a first round pick) saw him developing 20-25 homerun power someday. To the doubters out there (who we love because they keep Loney’s auction price down) I can only say that you also probably doubted that Joe Mauer would ever develop power. Loney is precisely the kind of player that savvy owners can collect at bargain rates. It seems like he has been around forever and his surface stats seem to reflect a player that has reached his level and has nothing else to offer. But he's young, he has tools, and best of all he has the skills to do almost anything with a bat in his hands. 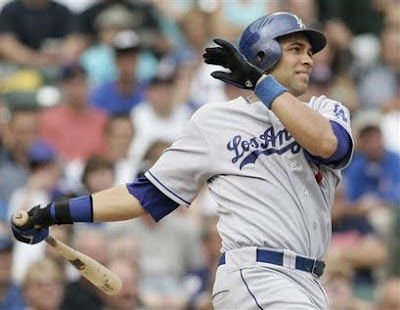 James Loney will be on quite a few of my fantasy squads this season. We have not seen the best of Loney yet.